My hastily written submission to the committee has just been published ! It was actually submitted a couple of days after the deadline so I am rather pleased it got accepted. My aim was to keep it short, avoid polemics, while trying to defuse the CAGW meme driving energy policy. I am an independent scientist. I have a PhD in High Energy Physics and previously worked at CERN, Rutherford Lab, JET Fusion Experiment and the Joint Research Centre of the European Commission. All opinions expressed here are entirely my own. The acknowledgement that up to half the observed warming since 1950 is due to natural effects. That climate sensitivity estimates have now been reduced. Manmade warming is likely to be less than 2C for a doubling of CO2 (560 ppm). The current pause in warming may well continue until 2030 due to a natural 60-year cycle in ocean dynamics (AMO/PDO) – see figure 1. Thereafter we can expect another period of rapid warming. 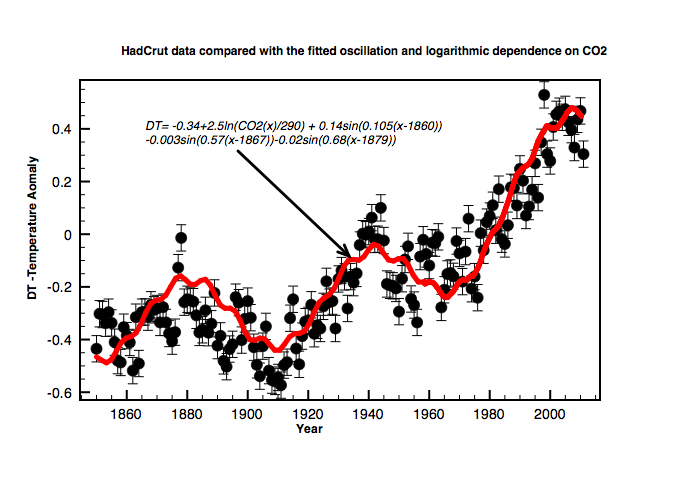 All AR5 climate models overestimated warming till 2012 because they excluded this natural oscillation – see figure 2. The risk of climate disruption and extreme weather impacts is very small. Sea level rise is a modest 60cm by 2100. Sea defenses can easily cope with this. There will always remain uncertainties in climate models due to the complexity of climate interactions. As an example scientists still cannot model the dynamics of past glaciations nor predict when the next one will occur. Another ice age would be far more catastrophic than global warming. The largest model uncertainties are clouds. Clouds play the same role as the white daisies do in Lovelock’s daisy world. Carbon targets can be relaxed. Investment in new wind generation too quickly is counter-productive as costs begin to outweigh benefits above 20% intrusion on the grid . 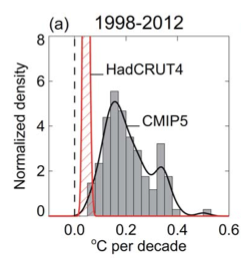 Fig 2: Comparison of CMIP5 models and observed temperature trends. 1. A cost Benefit Analysis of Wind Power, Eleanor Denny, PhD. Thesis , 2007 University College Dublin. This entry was posted in AGW, Climate Change, Energy, nuclear, renewables, Science, wind farms and tagged Climate Sensitivity, Clouds, energy security, IPCC. Bookmark the permalink. Clive, thanks for taking time to prepare this short submission which is much easier to read and digest than some of the others I looked at. The 60 year cycle will continue until it stops. I wrote it the morning after I got off the plane from Hong Kong. The 60 year cycle is probably due to regular variations in the MOC(Meridional Overturning Current) particularly in the Atlantic. and is reflected in overall cloud cover forcing effecting global temperatures. This is superimposed on human CO2 forcing. From 1970 to 2000 they were both in positive phase, but now the AMO is in negative phase causing the hiatus in warming lasting until 2030. Thanks for the good work and a voice of reason. Unfortunately, the reasoned approach is too often not extreme enough to make the popular media (a la the Sherwood tales). I appreciate the multiply faceted approach to energy sources. I noticed your inclusion of fusion (dear to your heart from JET programme, I presume). I would be interested in your thoughts on whether D-T fusion will be encumbered by the same regulatory/acceptance resistance as the fission industry experiences today. I would fear this as much as the technical challenges of scale-up. We now know how to build a fusion reactor. It is just a question of willpower and investment. A demonstration power reactor could have been realised by now, but as things stand we will now have to wait until about 2030. Pure fusion is inherently safe but PC over-regulation is surely capable of throwing a spanner in the works. There are just so many special interest groups given airtime by the BBC and mass media that are out to hinder any technological advance. Just today we heard that sugar is the new health threat just as dangerous as tobacco – as if anyone even cares. How does temperature depend on CO2?